Newt Gingrich is well-known as the architect of the “Contract with America” that led the Republican Party to victory in 1994 by capturing the majority in the U.S. House of Representatives for the first time in forty years. After he was elected Speaker, he disrupted the status quo by moving power out of Washington and back to the American people. Under his leadership, Congress passed welfare reform, the first balanced budget in a generation, and the first tax cut in sixteen years. In addition, the Congress restored funding to strengthen defense and intelligence capabilities, an action later lauded by the bipartisan 9/11 Commission. Today Newt Gingrich is a Fox News contributor. He is a Senior Advisor at Dentons, the world’s largest law firm w Newt Gingrich is well-known as the architect of the “Contract with America” that led the Republican Party to victory in 1994 by capturing the majority in the U.S. House of Representatives for the first time in forty years. After he was elected Speaker, he disrupted the status quo by moving power out of Washington and back to the American people. Under his leadership, Congress passed welfare reform, the first balanced budget in a generation, and the first tax cut in sixteen years. In addition, the Congress restored funding to strengthen defense and intelligence capabilities, an action later lauded by the bipartisan 9/11 Commission. Today Newt Gingrich is a Fox News contributor. He is a Senior Advisor at Dentons, the world’s largest law firm with more than 6,500 lawyers in 50 countries and offices in more than 125 cities. He advises the firm’s world-class Public Policy and Regulation practice. He is also a Senior Scientist at Gallup. From May 2011 to May 2012, Newt Gingrich was a candidate for the Republican nomination for President of the United States, winning the South Carolina and the Georgia primaries. The campaign was especially notable for its innovative policy agenda, its effort to bring new coalitions into the Republican fold, and for Newt’s debate performances. His $2.50 a gallon energy plan set off a nationwide discussion about the use of America’s energy resources. But there is a lot more to Newt Gingrich than these remarkable achievements. 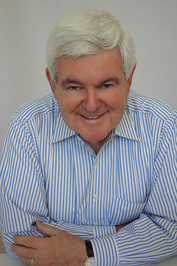 As an author, Newt has published twenty-nine books including 14 fiction and nonfiction New York Times best-sellers. Non-fiction books include his latest, Breakout, in addition to A Nation Like No Other, Ronald Reagan: Rendezvous with Destiny, To Save America, Rediscovering God in America, 5 Principles for a Successful Life, Drill Here, Drill Now, Pay Less, Real Change, A Contract with the Earth, Winning the Future: A 21st Century Contract with America, To Renew America, Lessons Learned the Hard Way, Saving Lives & Saving Money, Window of Opportunity, and The Art of Transformation. He is also the author of a series of historical fiction books including, Gettysburg, Grant Comes East, Never Call Retreat: Lee and Grant the Final Victory, 1945, Pearl Harbor, Days of Infamy, To Make Men Free, To Try Men’s Souls, Valley Forge, and Victory at Yorktown. These novels are active history studies in the lessons of warfare based on fictional accounts of historical wartime battles and their aftermaths. His latest novel, Treason, is the sequel to Duplicity and is a thriller of Washington intrigue and international terrorism. Newt and his wife, Callista, host and produce historical and public policy documentaries. Recent films include The First American, Divine Mercy: The Canonization of John Paul II, A City Upon A Hill, America at Risk, Nine Days That Changed The World, Ronald Reagan: Rendezvous with Destiny, Rediscovering God in America, Rediscovering God in America II: Our Heritage, and We Have the Power. In his post-Speaker role, Newt has become one of the most highly sought-after public speakers, accepting invitations to speak before prestigious organizations throughout the world. Because of his own unquenchable thirst for knowledge, Newt is able to share unique and unparalleled insights on a wide range of topics. His audiences find him to be not only educational but also inspirational. For more information about Newt’s speaking engagements, please visit the Worldwide Speakers Group. Widely recognized for his commitment to a better system of health for all Americans, his leadership in the U.S. Congress helped save Medicare from bankruptcy, prompted FDA reform to help the seriously ill and initiated a new focus on research, prevention, and wellness. His contributions have been so great that the American Diabetes Association awarded him their highest non-medical award and the March of Dimes named him their 1995 Citizen of the Year. To ask Newt Gingrich questions, please sign up. Back in June 2013, when Pete Earley, Joe Desantis and I began considering writing a novel about terrorism and a presidential campaign, we could not have imagined how much fact and fiction would blend together. Newt Gingrich liked Pete Earley's blog post: My New Novel Is Released: DUPLICITY. Written with Speaker Newt Gingrich! We’d love your help. Let us know what’s wrong with this preview of Duplicity by Newt Gingrich. We’d love your help. Let us know what’s wrong with this preview of One Second After by William R. Forstchen. We’d love your help. Let us know what’s wrong with this preview of One Year After by William R. Forstchen. This poll will examine the choices for the Ulysses S. Grant reading selection which will be the next President covered in the Presidential Series. The order for the Presidents selected was determined by the group membership. This selection will begin on October 4, 2010 and will continue for three months (October, November and December). This discussion will be led by Bryan. Bryan has an extraordinary background and will be a great moderator to lead this discussion. He has assumed the responsibilities for the Presidential Series reads and will be leading these book discussions. We have added all of the books nominated on the Ulysses S. Grant thread and a few others. However, if you do not see your favorite book on this list; then just comment or pop me a note and I will immediately add it to this poll. You can always change your vote at any time; so nothing is lost. Some of the Grant books deal with only a certain period of his life, some may be multi-volume (if so- I have added both separately), some deal with other topics too; some are all encompassing, others deal with specific events in Grant's life or presidency and others are by the man, himself. Before making your selection, please try to look up your choice and make sure it really is a book you are interested in; do not be lured in by the title. Also, check out the author and what others have said about the book before you (reviewers who you trust). Then of course, make your selection.